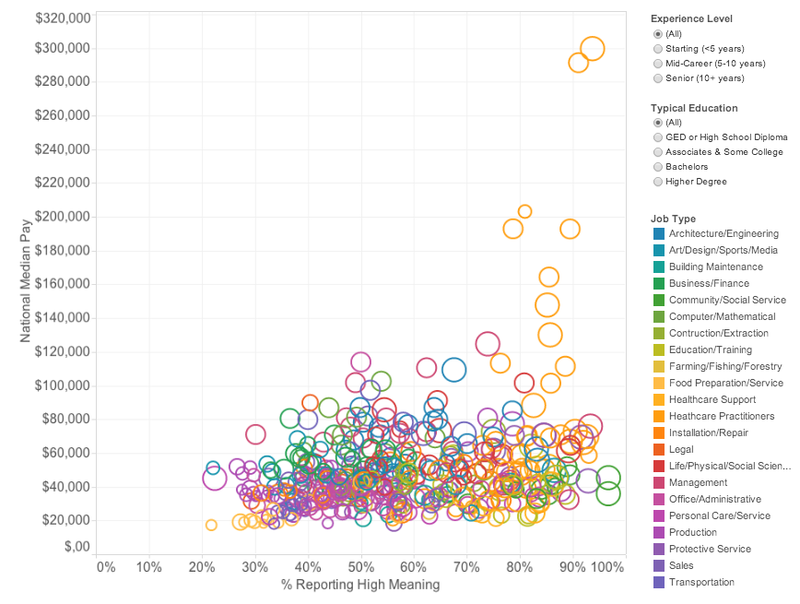 What Jobs Do People Find Most Meaningful? For meaningful work and high pay, become a doctor. For work that doesn't feel meaningful, become a lawyer. Does a preference for "meaningful" work necessitate a lifetime of modest compensation? Not for those who choose to go into medicine. That's the finding of a new study from the online salary- and benefits-tracking company PayScale. Using data collected from about 374,000 PayScale site visitors, researchers at PayScale found that doctors tended to have the best combination of high compensation and a positive response to the question "Does your job make the world a better place?" Overall, the group with the best combination of meaning and money is surgeons, 94 percent of whom report finding their work meaningful and whose median compensation was just shy of $300,000. They did, however, also report high levels of stress. PayScale found that people employed in a group broadly labeled as "community and social service workers"—therapists, clergy, directors of religious programs—were most likely to report that they found their work meaningful, at 84 percent. Clergy, in particular, thought their work was making the world a better place: 97 percent answered in the affirmative. Unsurprisingly, this group isn't getting rich in a pecuniary sense: Clergy had a median annual pay of $45,500; directors of religious programs made $35,900; marriage and family therapists came in at $47,100. The report noted that jobs in these fields are more likely to be filled by women and that, in general, female-dominated professions were more likely to be high-meaning and low-earning, the lower right-hand corner of the chart below. Of course, many jobs earn little in both cash and fulfillment. Low-paying service jobs—food prep, cashiers, fast-food cooks—were both poorly compensated and not meaningful (the chart's lower-left area). No professions at all fell in the chart's upper-left-hand reaches: highly remunerative and not very meaningful. Those employed in legal services (which includes lawyers in addition to paralegals, clerks, title examiners, etc.) were doing the best of the low-meaning jobs, making $49,000 a year. Lawyers, the top-earners of the bunch, make on average $89,800 and 40 percent said their jobs made the world better. (They too reported high stress.) Financial analysts have the same rate of finding "meaning" in their work as lawyers do, but they make slightly less—$64,900. Over email, PayScale's lead economist Katie Bardaro added that these compensation numbers are national medians, so outliers such as top Wall Street bankers don't push the circle for financial analysts up into the upper-left quadrant. Of course, not everyone prioritizes finding "meaningful" work, and the report adds that job satisfaction "is not necessarily tied to job meaning." Gaming supervisors—people who run tables in casinos—report high levels of job satisfaction (80 percent) but low meaning (22 percent). OBGYNs, in contrast, don't find their jobs very satisfying but do find them meaningful (they're also paid well for it—more than $200,000). Lastly, surveys like this give a very broad-brush picture, and any given job can diverge wildly from these reported rates. Do lawyers working in criminal defense feel the same way about their jobs as those working in corporate litigation? Unlikely, but that's not the level of granularity we've got here.